The Coast Range’s tallest waterfall plunges 266 feet into an old-growth forest canyon. 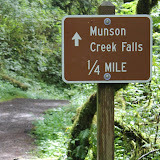 It’s just off Highway 101, but surprisingly few travelers discover this small state park and the easy trail along rushing Munson Creek to the base of the slender, 5-tiered cataract. The falls are named for Goran Munson, who came from Michigan to settle near here in 1889. Click on the photo below for a photo tour of Muson Falls and nearby Whalen Island.